Would You Live Off-The-Grid In This? Renowned architecture firm Skidmore, Ownings & Merrill LLP (SOM) has unveiled an 3D-printed off-grid building with built-in solar panels that can be powered by just a car. SOM worked in partnership with the US Department of Energy's Oak Ridge National Laboratory (ORNL) to create what they say is the world's largest 3D-printed polymer structure. Developed as a prototype, the project is part of the Additive Manufacturing Integrated Energy (AMIE) project - an effort that brought together leaders from government and industry to pioneer innovative methods for building and operating energy-saving structures. 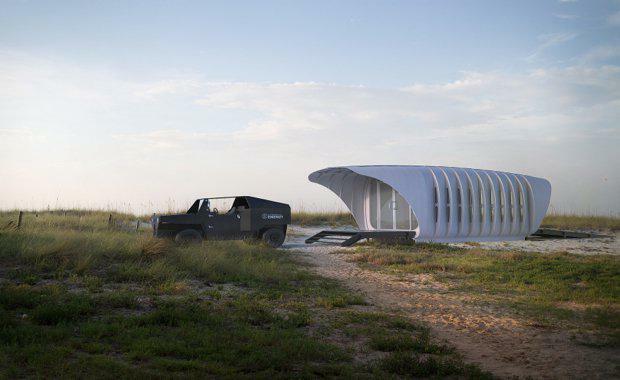 InHabitat, the building is comprised of a series of C-shaped sections, and bi-directional energy flow makes it possible for the 3D-printed structure and a hybrid car to keep each other charged - 24 hours a day.